It makes simple video editing tasks a breeze. AVS Video Editor 8.0 bills itself as “easy video editing software,” and it nails the ease of use with great help resources and a very straightforward interface that almost works like a wizard guiding you from step to step. It’s just too bad it’s not more powerful for the price. The interface, features, and controls cover all the basics, and are standard. If you’ve used another video editor before, you’ll learn AVS quickly. If you haven’t, an exceptional library of video tutorials makes learning very easy. AVS helps you edit videos in a very traditional workflow, and its core functionality is good. Unfortunately, there are not a lot of special features like 360 video or automation, other than a fully-functional MIDI music editor and drum machine in its sister application. More disappointing is the fact that AVS does not offer the same multi-track video editing features found in some other software, as it supports only one standard video track. This limits the software to basic home video editing and equivalent tasks. However, you can sequence as many videos as you’d like in that main video track, and multiple video overlay tracks are supported. 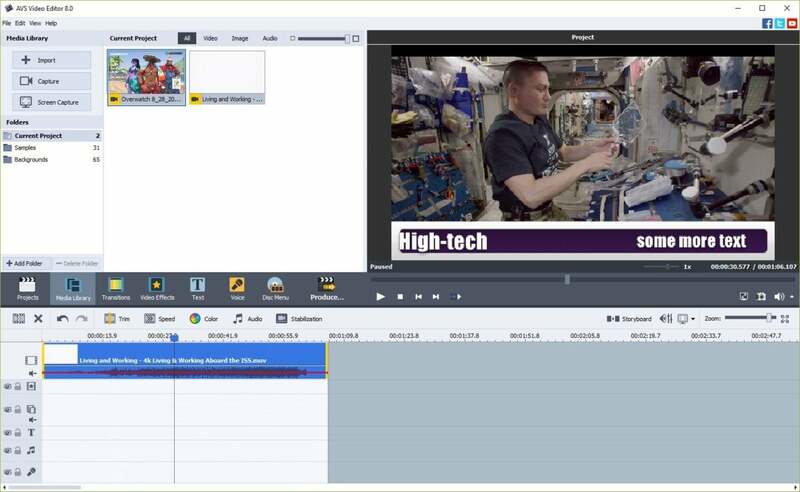 This review is part of our roundup of best video editing software. Go there for details on competing products and buying advice. 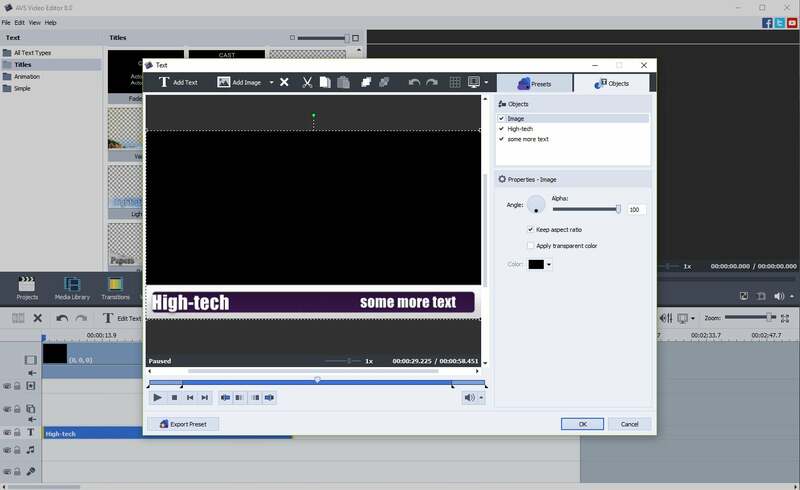 AVS Video Editor's features include a text title editor with a few style options. Importing is simple: You can import media files, capture from an attached camera, or capture your desktop screen. AVS also has a basic media library that allows you to keep track of the various media you’ve imported. Just note that it doesn’t include any of the intelligent sorting or curation features found in some other software suites. The program does come with a good library of transitions and effects, as well as support for in-app voice over recording, picture-in-picture, titles, and a DVD menu creator. While none of these features are as robust as they might be in some other applications, that’s counter-balanced by the ease of use, and we did find that AVS’ tool excels at supporting numerous formats and conversions. We had no problems when testing this with different formats. AVS wins big points for its ease of use and simplicity. If you’re just looking to slice some family videos together or convert a video to a format that will work on your phone, AVS is a solid buy. But if you need anything more sophisticated, look elsewhere, because its modest feature set leaves something to be desired for serious users. AVS Video Editor nails the ease of use with great help resources and a very straightforward interface that almost works like a wizard. It’s just too bad it’s not more powerful for the price.